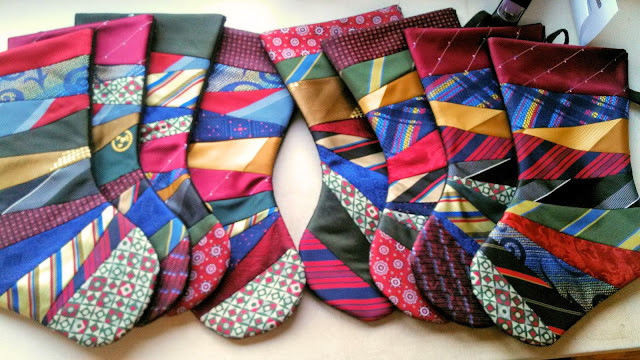 I have had several people ask me about the Christmas stockings that I made from my grandpa's neck ties. I posted about them 2 years ago, but have had numerous requests recently for a pattern. First off - please change your settings if you are a NO REPLY COMMENTER!!! I can not respond to you if you are! If you don't know how to change it, follow this link for the instructions at Humble Quilts blog. If you aren't sure about any of this, be sure to leave your e-mail address in your comment. A friend and I made a couple hundred stockings for our troops several years ago, and at that time we made a plastic template (you can use cardboard if you don't have any template plastic) of a stocking shape. Just draw a stocking shape that you like, in a size that you like. The top of mine is 8 1/2" wide and the stocking is about 15" long. It's 7" wide where the curve starts into the foot (hope that makes sense). I then traced this onto muslin, and used the muslin as foundation to sew the ties to. Roughly cut out the muslin - outside of the line - you will trim it down to the line later. For the backing, I used Christmas fabric - you could do ties on both sides if you wanted. I also sewed muslin to the back to give it more stability and to give you a finished edge at the top of the stocking - just sew the backing fabric and the muslin together (right sides together) across the top and flip over, then press the top. What takes the longest is to take apart all of the ties. I was lucky, because my husband actually did this for me! He just worked on them in the evenings in front of the TV and had them done in no time. I just keep them all in a tote, and dig through and find colors and prints that I want to use in the stockings. My gramps had a ton of ties, so I have lots to choose from. You just want to use random shapes and sizes, and piece them onto the foundation. It's done exactly like paper piecing, except you're using muslin instead of paper. You can see in the picture that I tried to use a little bigger, straighter piece at the top and the toe, but what you do is totally up to you, just make sure that you have a big enough piece to cover that section of the foundation pattern. After you have all the ties sewn onto the foundation, use scissors to cut out the stocking on the traced line. I then sewed another piece of muslin to this (sew them together along the top edge of the stocking - sew right sides together, then flip over - so you have a nice finished edge along the top). Because there are so many layers, I pinned them all together so they don't slip while sewing - stockings right sides together - and just sew 1/4" around the edge (not the top). Don't forget to sew a hanger into the side. I just used a piece of ribbon, made a loop and pinned it in with the layers. Turn it right side out and there you have it! Let me know if you have any questions, and I will do my best to help! Bees,cute kitties and is this election over yet!? We are finished vending for the year, and now it is time to re-group and catch up. Going through things this morning, I realized that I am really low on jewelry! I will be adding a bunch of new stuff to my website today, then it's time to start building inventory for our next show, which is in Dallas in March. I still love the little bee charms and also the amber and gold beads. I've been building up a nice bead stash and was able to stop at a great little bead shop in the Des Moines area, on the way to the Ft. Dodge, IA show. So now I have a big fat fabric stash, and a little dainty bead stash - lol! I rarely talk about politics, because I am so sick of it all, and think they are all a bunch of crooks and liars. I can not wait for today to be over with. I voted a few weeks ago, but I have to say that I think our choices are horrible and I just don't understand how we got ourselves into this mess. What are the next 4 years going to be like? For those of you in other countries, what are your thoughts of our election season this year? It's an embarrassment, as far as I'm concerned. I truly can not stand either one of them! And talk about depressing (wow - this post has gone grouchy in a hurry!) - I had to attend 2 funerals last week. On Tuesday, it was for a friend of mine from high school who died from injuries sustained in a motorcycle accident. It was horrible. She was just 52 years old. And the very next morning, another friend from my class in school had a massive heart attack and passed away. I had just talked to him the day before at the other funeral. He was 50 (don't know how my friends from HS are so old, since we all know that I'm 29). Both such a shock, a huge loss, and just a tragedy. A week like that truly makes you see things differently and appreciate life a little more. Ok, this is a new week, all this election garbage on TV is almost over (then the real mess begins) and my little Grubby kitty is doing SOOOOO good! You can't really tell from the pictures, but he looks a million times better than he did when he showed up in our yard a month ago. I wish I would have taken good pictures of him when he first came here - he had no hair at all on his back and now it's growing in all silky and soft. I think he's bow legged from holding up his huge belly! Look at that face! Trying to show you his FUR! Little cutie! And I had to show you that Ozzie is still quite helpful! Callie always thinks she needs to be in this cupboard if the door is open! I love her cute little white paws. I call her Bootsie just as much as I call her Callie! Back to work - I'm going to add new jewelry to my website right now, so make sure to go check it out! It's time to start Christmas shopping! !